So a while ago I found a couple of Instructables about how to turn old plastic coke bottles and other various items into upside-down hanging planters (such as this one here). I thought it was kind of a cool idea, but it just looked far to scrappy to fit in with the rest of my place and wasn't something I would actually want to hang in my window or garden when guests come about… So I began thinking about how to make this idea a bit more aesthetically pleasing and decided that putting the plants into a planter made of solid material, instead of cheap plastic, was a pretty solid solution (no pun intended), which led me to wine bottles. Now this is my first Instructable, so any advice on how to improve on this is quite welcome (as I'd love to make more)… But since everyone has to start somewhere, here goes my dive into the world of Instructables! For starters, let us grab some materials... This project, as with any project, requires certain materials which are listed below. For the most part everything you need is on that list, but I'd advise giving this Instructable a quick 'once over' before making your shopping trip for two reasons. The first is because once you hear my explanations you may decide that a different material may fit better with your take on my ideas… As you may have gathered from my intro paragraph or from the amount of Instructables I link to that I am a huge advocate of taking an idea and making it your own. Secondly, those links I just mentioned may also require materials if you decide to go a different route than I did. But if you choose to do this exactly the way I did, then everything you need should be listed below. And if you'd like to for-go the cutting jig altogether, here's a couple other ways to go about bottle cutting. If you choose one of the above methods, you can probably just skip to step 3 or 4, otherwise, here's how to cut your bottle (Although technically we're just scoring it right now). So to cut the bottle you must first score it. To do this you need to adjust your bottle cutter to the right position to cut as little or as much of the bottom of the wine bottle off as you desire. Once you're happy with where the score will be made and you have your bottle positioned on your cutting jug you need to rotate your bottle on the machine while applying consistent pressure to the bottle in order to make one continuous score (you should be able to hear the glass being scored). You will want to try and do it all in one continuous line, spinning the bottle back and forth tends to score different areas differently, making the bottle more prone to cracking (which could give a cool effect if that's what you're going for, but I tend to like the clean breaks myself). If you listen you should be able to hear a faint click once you reach the point where you began the score, at which point you would want to stop... One rotation is all you need. Remember, you're not actually cutting the glass with this device, you're just scoring it. To break the glass you need to stress the glass until the score cracks all the way through the other side of the bottle… Now a lot of people will use a candle and ice/snow to do this, however I find that alternating between cold and hot water is the best method. Before I decided to use hot and cold baths I did took the minimalist route of boiling water in a kettle and alternating between pouring hot water over the crack and cold water. While I have used this method on glass pop bottles and found it works pretty good, Wine bottles have a much bigger surface area making it more difficult to evenly heat. So I would recommend actually using baths if you don't want to break your first few bottles like I did. Or at the very least practice on some junk bottles if you have a very specific bottle you'd like to use. Once the bottle has broken where you want it, it's time to take that nasty edge off so no one slices their fingers on it when placing plants in it, or any other action that may involve hands on the planter (this will also help to keep shards from breaking off the lip you just created). The first step to this is to even out the flat part of the edge (though this is more of an aesthetic thing if you actually managed to get that break 100% perfectly clean, so if you like that shiny looking edge and think that your break was flawless then you can skip the flats and move to the edge of the bottle). But for those who prefer a bit more of a foggy look on their edge, like me, you will need to sand that edge down. To do this find a piece of glass or a flat solid non-wooden object you do not care about at all (because this will wreck any finish it once had, I used a shelf from my old fridge). Sprinkle some aluminum Oxide on it and wet the edge of your bottle (You don't really need to wet the edge of your bottle all the time, but I find that when starting on a new surface that it helps keep the aluminum oxide where you want it until there's enough of a grit on the surface that you're working on to hold it without the moisture). Now place the edge down on the grinding surface and just grind that bottle into the table with a circular motion until it feels like you need to apply more aluminum oxide and continue this process until you have a nicely fogged edge all around the rim (sometimes it's hard to see with the moisture, but a quick drying of the edge should show you what still needs to be ground away). Just as a warning though, this can be a very noisy process that kicks up a lot of glass dust, so Ear protection and a dust mask may be a good idea depending on how sensitive you are to those sorts of things. Now here's where you can get creative. I'll tell you what I did, but don't let that stop you from thinking up your own unique ways of making the bottle hang upside-down. For my first planter I basically took craft wire and twine and treated it like I would a hemp bracelet (I don't exactly know what that kind of weave it is called, though I think it is similar to macrame if not the exact same thing). And I wove the twine around the wire to hide the wire from sight. For my second planter I eliminated the craft wire and decided to intersect the weave every now and then to help it keep it's shape. This hemp bracelet weave is kind of hard to explain without pictures, so if ever you were to reference the pictures this would be a good time for it... But basically you will have a minimum of 3 strings (I usually use two and fold them over to make 4) two on the outside and the rest in the middle (the more strings down the middle the thicker your end result will be). Take one string and make a 4 over the top of the middle string. 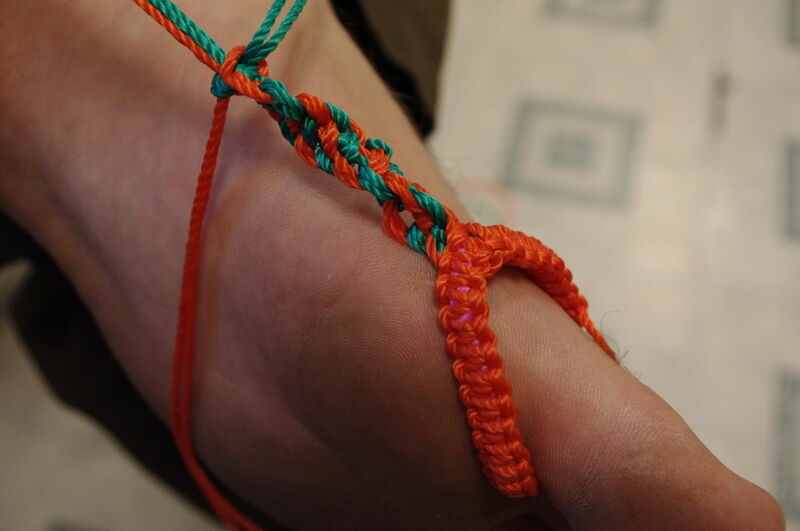 Then take the other string and go over the tail of the 4. Then Bring the string under the cross of the 4 and pull it up through the middle. Again, this sounds really confusing, but it's quite simple once you see the pictures... It was one of the favorite camp crafts back when I was a counsellor, so if you can't figure it out go see if your children are better at understanding my child care saturated mind. The moment we've been working towards, the planter is finished and now it is time to start planting. Now before you put just any old plant in the bottle, keep in mind that it's not going to get much sunlight inside that bottle and that the necks of most wine bottles are pretty long. So you will (a) want a plant that is hearty enough to survive being jammed through the neck of a wine bottle, and (b) a plant big enough to have leaves that are outside of the neck of the bottle so that it can absorb the sunlight it so desperately needs so that you're not starving your plant from light inside the neck of your wine bottle. I've had one plant in a bottle for 3 weeks and it's just about to start blooming again, so don't expect it to recover from this trauma overnight. And it is traumatic for the plant, so picking a plant you think can withstand trauma is quite important. I also bought a creeping plant to plant in the top of my planter, I don't know if they'll be able to live happily together or if one will kill the other, but I thought that if I could make them play nice together that the creeper out of the top would look pretty awesome with the flowers coming out of the bottle neck. So here's the biggest challenge, getting your plant through that neck alive. What I have taken to doing is Wrapping the plant in a paper or something that will contain the leaves and wrap it as tightly as you can without damaging the plant while also making it tight enough to fit through the neck of the bottle (it is a delicate dance)… I've found rubber bands to be a pretty good way to keep the plastic wrap nice and tight while you work it through the neck of the bottle. I've also taken to putting some leftover twine in the elastic band to help with pulling the plant through the neck by lowering the twine down the neck and gently tugging the plant through behind it. Now taking off the paper and rubber bands can get a little tricky… If they seem to be getting stuck you can try and carefully cut it away without also cutting your plant. I don't know as much as I could for working 2 summers in a Garden Center, but I imagine that what gets left behind will eventually get pushed out as the plant grows. However, once you get your plant through the neck it's time to actually plant the thing. It's a good idea before you add the soil to massage the roots of the plant so it doesn't get root bound from having sat on the shelf of the garden centre for so long. Next you'll obviously add the soil (I tried adding moisture crystals to this 2nd planter to try and reduce the drainage for indoor hanging, but I'm afraid that I may be drowning it now). And Finally I planted some grass in the top of the first one and that creeping plant in the second to add some nice plants to the top of the bottle. Again, I'm not sure if both can survive, but I figured I'd give it a shot because it will sure look a lot cooler if they can both live together. Now you simply need to find a place to hang it and you are done! If you haven't figured out where to water it by now, it is in the top of the bottle where we planted the grass/crawling/creeping plants. Enjoy! Actually, based on the first one I built (the one without the moisture crystals) having that plant coming out the bottom doesn't hinder drainage at all, it almost acts as a mesh of its own (if you can keep it alive). And I personally prefere the flower out the bottom, but to each his/her own. Oh, how pretty! This is a great reuse.